Wylla has that, "Who me? I'm just sitting here" look down pat. Such a cutie. Oh I love you sweet Wylla Stout! 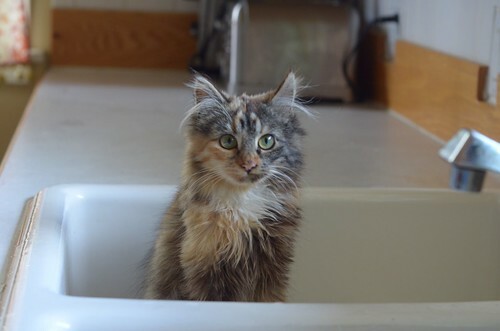 Don't tell me you're asking Mom for a bath, Wylla! 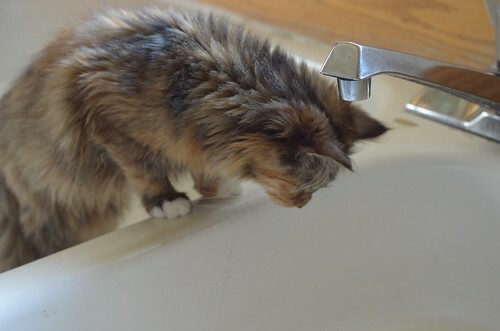 Or are you just curious to sample the water from the faucet? 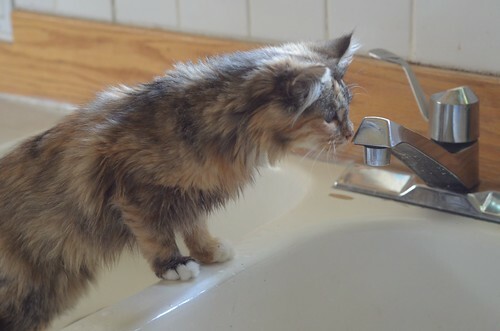 You certainly wouldn't be the first kitty who preferred faucet water to a bowl. Ha! Sweet little Wylla! My Frankenstein loves to drink out of the faucet! She doesn't see what the big deal is. I love that little face! So chill...and so naughty! That silly monkey girl...Can she jump up onto the kitchen counters, or did she have to climb? She just leaps. She hardly weighs a thing, so it's easy for her to get it off the ground. Certainly not the first cat to sink-sit.. All 3 of mine do it. It must be cooler in the sinks. Was also perusing some of the older posts via the little thumbnails at the end of the post on the home page.. Had to laugh since several of them were links to the 15 Squillion fundraiser 4 years ago with the Darlings. Ah, such a lofty goal back then. Glad to know that we eclipsed that by nearly 10 times this year! This makes me think of that commercial - "vhat are you sinking about?" Since she gets so many meals that require her to 'stand up' she probably has more push-power to each of her ounces than the average kit...she just 'floats' and lands somewhere. I feel like she's sitting there waiting for the magic to start. 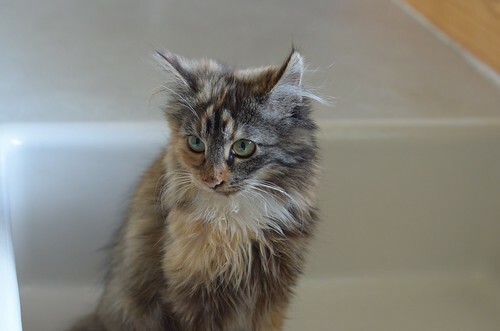 It looks like she's saying "What happened to the water? It was just there." Wylla is adorable, no matter where she is. She does have that "What can I get into next?" look about her, though. She's a handful! This is why those touch faucets are a REALLY bad idea. 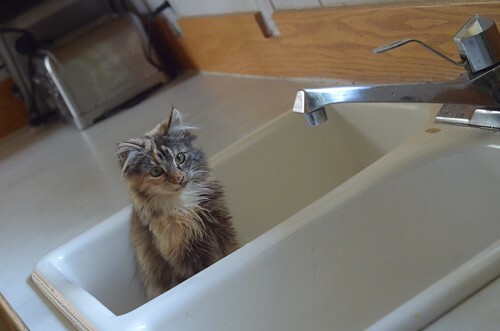 How nice of you to have two sinks for Wylla's enjoyment. What amazes me is how kitties will jump (or float) somewhere without knowing what's "up there," just that it's where they want to be. So trusting. Wylla goes everywhere, doesn't she? She's sooo awesome! What is it about tortoiseshells and sinks?